Nicotine exposure at a young age "may cause lasting harm to brain development," warns Dr. Tom Frieden, chief of the Centers for Disease Control and Prevention. 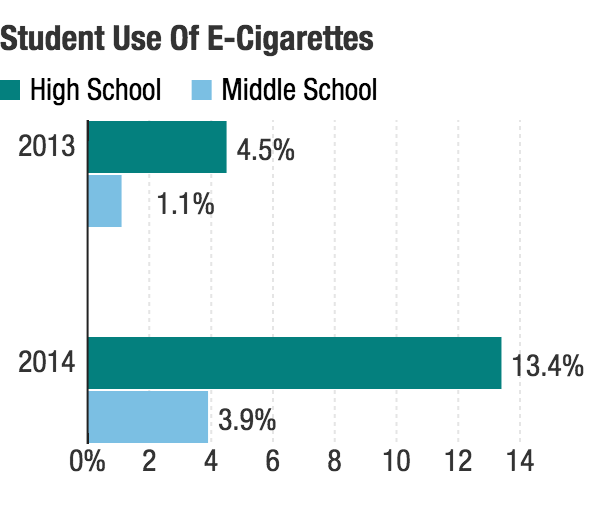 A national survey confirms earlier indications that e-cigarettes are now more popular among teenage students than traditional cigarettes and other forms of tobacco, federal health officials reported Thursday. The findings prompted strong warnings from Dr. Tom Frieden, head of the Centers for Disease Control and Prevention, about the effects of any form of nicotine on young people. "We want parents to know that nicotine is dangerous for kids at any age," Frieden said. "Adolescence is a critical time for brain development," he added, in a written statement. "Nicotine exposure at a young age may cause lasting harm to brain development, promote addiction and lead to sustained tobacco use." The findings are similar to those from a study reported in December. The CDC survey also found that hookah use doubled among middle schoolers and high school students, while use of traditional cigarettes fell for high school students and remained the same for middle school students. The new evidence comes as the Food and Drug Administration is deciding how strictly to regulate e-cigarettes. The devices heat a nicotine-laced fluid, which then becomes a vapor that users inhale. While many doctors say the vapor of e-cigarettes is likely less damaging than the smoke of burned tobacco leaves, there is intense debate about how safe e-cigarettes are. Some public health researchers say the electronic devices may be useful for helping some smokers give up traditional cigarettes. But many also fear the devices may hook a new generation on nicotine and lead them to start smoking traditional cigarettes. "The release of this survey couldn't be better timed," said Nancy Brown of the American Heart Association in a written statement. "The take-away message is loud and clear: Tobacco regulations need to be finalized now. We cannot stand by while more and more youth put themselves at risk for heart disease, stroke or even an early death." But the makers of e-cigarettes argue that the devices may be helping drive down the rate of regular cigarette use among teens. "While the use of vapor products by teens should be discouraged, the data is clear that as teen experimentation with vaping has grown over the last three years, youth smoking has experienced the largest decline in the history of the ... survey," Gregory Conley, of the American Vaping Association, told Shots in an email. "This dramatic fall in teen smoking should be part of the discussion," Conley said, "but the CDC deemed this finding to not be worthy of a single line in their press release. That is not surprising, as it would interfere with the CDC's evidence-free attempts to paint e-cigarettes as a potential gateway to traditional cigarettes."